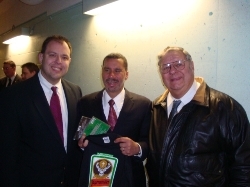 Shortly after Fritz and Fred Scherz Sr., presented New York State Governor, David Paterson with some FPB CDs and FPB/Jagermeister t-shirt on November 11th in Syracuse, NY, the guys pose for a photo together. 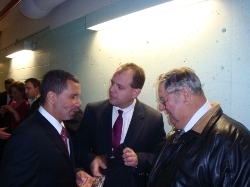 New York State Governor, David Paterson greets Fritz and Fred Scherz Sr., in Syracuse, NY on November 11, 2008. 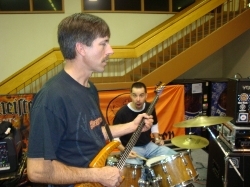 The FPB double guitar threat of Tom and Frank, tearing through a tune on November 8, 2008 at SUNY I.T. at Utica/Rome, in Marcy, NY. 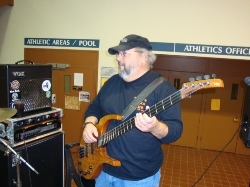 Frank plays bass while Rick plays drums during FPB's gig on November 8, 2008 at SUNY I.T. at Utica/Rome. 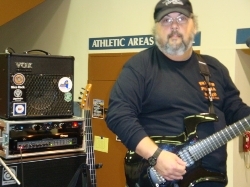 Gabe is pictured here with his Parker on November 8, 2008 in Marcy, NY. 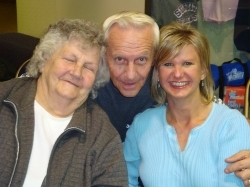 Tom snuggles in close with Marie (L) and Carol (R), during FPB's gig at SUNY I.T. at Utica/Rome on November 8th. 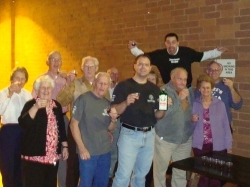 Tom, Fritz, and Rick tip some Jagermeister punch with members of the Fritz's Polka Band Fan Club in Marcy, NY on November 8, 2008 at SUNY I.T. at Utica/Rome. 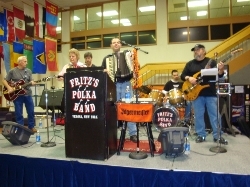 An up close picture of Fritz in action on November 8th, as FPB Fan Club Member, Betty Miller, as well as FPB members, Tom and Frank are shown in the background. 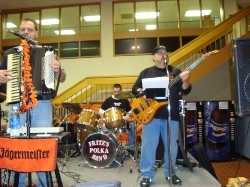 Fritz, Rick, and Gabe are pictured here on November 8th during FPB's gig at SUNY I.T. at Utica/Rome in Marcy, NY. 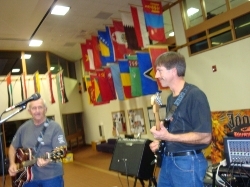 Tom, Frank, Fritz, Rick, and Gabe are shown here during FPB's second set of November 8, 2008, as FPB Fan Club Member, Betty Miller jams along with them. 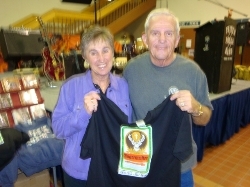 Tom presents an FPB/Jagermeister shirt to Mary Perrone during FPB's gig at SUNY I.T. at Utica/Rome on November 8th. 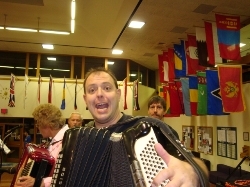 Mary booked FPB for the gig (Thanks, Mary!). Gabe and his Parker on November 8th at SUNY I.T at Utica/Rome.